While beyond the scope of a beginner, you certainly don't need to be an expert with cards to pull off this routine. With a borrowed deck in hand, the main sleight you'll need to manage is a certain steal, which is well within the capacity of intermediate magicians (and likely already in their grasp). And of course everything is fully taught on the video, so if you don't know it already, you'll learn it quickly. This trick is obviously not a self-working wonder, and you will need to master all the moves carefully so that you can focus on the presentation, which is especially important for making a strong impression with this routine. But it's really not a difficult routine to do overall. 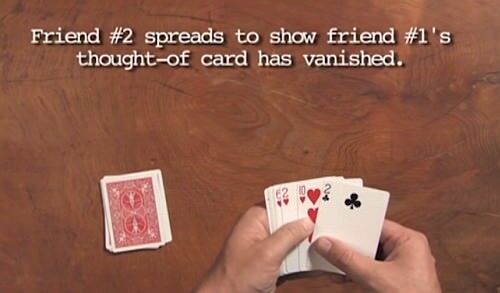 The original version of this trick was created by Theodore DeLand. And this statement is simply not true: "I've personally never had opportunity to try the original Strange Travellers routine, although I do know how it works and the gimmicks it uses, and I do love the strong impact of the routine as performed by David Blaine and others. But it does have an obvious weakness - you have to protect those cards, because you're in real trouble if the spectator starts grabbing cards and examining everything, because it won't take much to tip the method." It is not a weakness on the part of the effect--it is a weakness of your ability to adequately present the trick. If you have any ability as a magician, and even the smallest bit of ability in your presentation, this is a non-issue. Spectators only grab cards if you give them the chance, and if you don't give them something else to think about. Thank you for your comments, Richard Kaufman. You are of course right that what I mentioned as a "weakness" is really all about the magician's ability to manage his spectators. A good magician will certainly find ways to overcome this, and ensure that it isn't a problem. Especially notice the final two seconds - starting at around 1:45. You can see that the spectator does actually start grabbing the cards, and David Blaine has to act quickly to prevent this. Is the fact that this happened a weakness in his presentation? Perhaps. But even though Blaine has his critics, I'm sure we can all agree that he does have some ability as a magician, and yet this still came up as a problem in his particular performance, and he had to deal with it. The one advantage of Naked Strange over Strange Travellers is that you don't have to worry about this concern at all, and you don't have to tailor your presentation in such a way to prevent this. Instead, you can even use a presentation that does have the spectator handling and examining the cards at the end, and thereby emphasizing the mystery. In that respect the method of Naked Strange opens possibilities for a type of presentation that Strange Travellers wouldn't allow, due to the need to manage your spectators in the way that you describe. Thank you for raising this matter, and emphasizing the importance of presentation here. I also appreciate your mentioning Theodore DeLand as the original source of the Strange Travellers routine. I had tried to find sources beyond the Nate Lepzig mention, but without success, so I'm grateful to learn that DeLand came up with this orginally. I believe that Henry Hardin had a method for a similar effect that used double-ended cards, whereas DeLand's method in his version Cagliostro Cards used double-faced cards, and it is this method that Paul Harris adopted in Strange Travellers. You are of course an authority on DeLand, so I welcome that clarification. Out of interest, what was the clever addition to DeLand's routine that Paul Harris added, to develop it into Strange Travellers? face up and ten face down. The spectator thinks of ANY of the ten face up cards. shown in the eleven card packet! now eight cards and twelve. The second thought of card has also jumped across! I have seen a video of Doug Henning on a TV show where the host tried to grab the silk he was using. Doug backed away so the guy couldn't get it but the very fact he backed away ruined the effect as it was perfectly obvious to millions of viewers that there was something wrong with the silk because he wouldn't allow it to be examined. So, sure you can"manage" spectators so they don't examine your props but you can't manage what they are thinking. And they will often think, "he doesn't want me to examine that thing. There must be something wrong with it so my suspicions are correct." And not only will he think that so will everyone else who sees the interaction. You can indeed perform with such an air of authority that it can intimidate an audience member from even asking to examine something but you can't do a thing about what they are thinking if you don't let it happen. For a formal show this is not a big deal but it certainly is if you are performing informally. You should be prepared to let things be examined if you are working impromptu. If you refuse or make some excuse you will be the loser and they will be the victor. They will know your prop is faked in some way if you decline or try and waffle your way out of it. Similar non-gaffed versions from Edward Brown, Bruce Bernstein, and Greg Chapman, though I don't believe any bikinis were involved. The original version of Strange Travelers combines two different Theodore DeLand tricks into one really good routine. (Paul Harris's idea, and a brilliant one.) 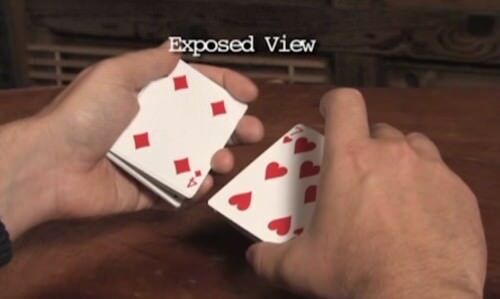 This is an excellent routine, and better for close-up (where the faces of the cards can be seen) then methods with sleight of hand. It's not some undistinguished method of many. In my next book, The Bammo Book of the Gypsy Queen, there will be a similar effect. 7 cards are counted into the first spectator's hand face down and he holds them. A second spectator scans the ENTIRE remaining deck and THINKS of a card. He does not reveal it. Deck is fanned and the three mates of the thought card (whatever it is) are there but the thought card isn't. The first spectator counts his cards: there are now 8--and the thought card--now revealed for the first time, is one of them. Ricky Jay's methodology in this trick, is arguably superior to the others. If one however, were to make the claim that it is definitely superior, they would get no argument from me. What is definitely not debatable is that Mr Jay's performance is far superior to the others, be it Blaine, that guy on the beach, or anyone else. While others are presenting a card trick in the hopes that it will be entertaining, Ricky Jay is himself the entertainment. 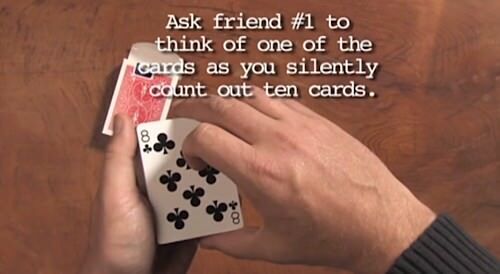 The card trick, although very good, is incidental. 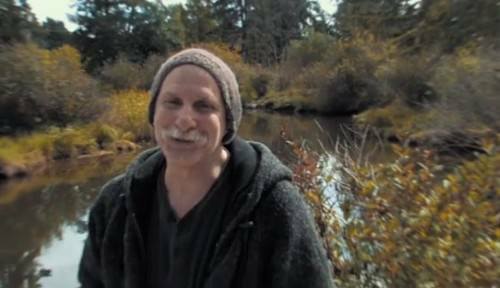 To Mr Jack Shalom: Thanks for sharing that video clip. A great performance from Ricky Jay indeed - a true entertainer and showman! To Mr Richard Kaufman: Do you happen to know the names of the two different Theodore DeLand tricks that Paul Harris combined to create the original version of Strange Travellers? I seem to remember reading somewhere that one was Cagliostro Cards, but wasn't aware there was another DeLand trick involved as well, so I'm glad to learn that. I have a long chapter in my book about this trick.